Ashley Deary looks to pass. The senior tallied 9 points and four assists in the Wildcats' 20-point win. Northwestern didn’t so much exert its dominance. It was more Wisconsin displaying its ineptitude. Either way, the Wildcats got the victory. 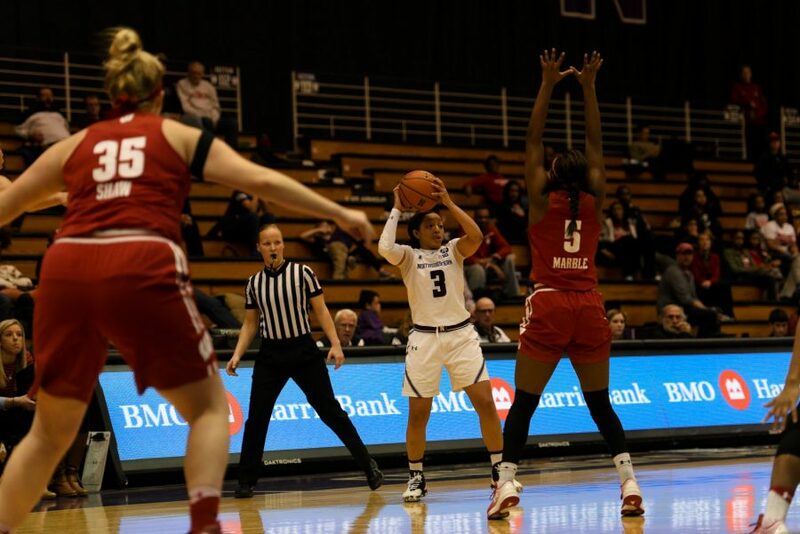 Senior forward Nia Coffey scored 15 points and added 10 rebounds, senior guard Christen Inman scored 14 points of her own and NU took advantage of 22 Badgers turnovers and a 33 percent shooting effort from the visitors, giving the Cats (17-5, 6-3 Big Ten) a 63-43 win Wednesday at Welsh-Ryan Arena. NU also struggled to find a rhythm, scoring just 24 points in the first half and making only 7-of-18 3-pointers. Just two Cats scored more than 11 points, and seniors Ashley Deary and Lauren Douglas combined to shoot a poor 6-of-21 clip from the floor. Still, it was far a better effort than Wisconsin (5-17, 0-9), who failed to put a player in double figures and did not score for the final 7:21 of its 14-point first half. It was a poor output even for the Badgers, who are 12th in the Big Ten in scoring offense and have reached 60 points just twice in conference play. NU’s defense is certainly among the conference’s best — the Cats allow opponents to shoot under 38 percent and claim a hawkish on-ball defender in Deary — but many of Wisconsin’s errors were self-inflicted. The Badgers were called for several traveling violations and players stepped out of bounds on multiple occasions. Tellingly, NU had just nine steals on Wisconsin’s 22 turnovers. The visitors also struggled to make shots. Several shots clanged off the backboard, including a free throw, and leading scorer Cayla McMorris finished just 5-of-13 from the field. It was that offensive futility that allowed the Cats to pull away, scoring 10-straight points to close the first half and open the second, as they turned a slender 2-point lead into a comfortable 12-point margin. Wisconsin cut the deficit to 9 late in the third quarter, but NU quickly rebuilt its advantage to close out the 20-point win. The result was hardly surprising. The Badgers entered the game on an eight-game losing streak and have now lost five Big Ten games by more than 20 points. NU, meanwhile, received votes in both the Associated Press and coaches polls this week and is in prime position for a return to the NCAA Tournament. A win over the conference’s bottom-feeders won’t help the Cats’ resume, but a loss certainly would’ve damaged it. And like Sunday’s victory at Rutgers, NU ground out a low-scoring win on the shoulders of its defense. This story was updated at 9:48 with quotes.